On my own at lunchtime, I have started a new TV show: Rise, about a high school drama club in a small town. I'm enjoying it so far - it's kind of like Glee, only about drama and with a more serious tone. 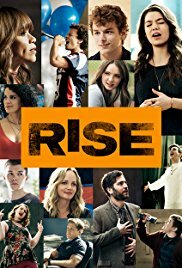 Josh Radnor (well-known for playing Ted on How I Met Your Mother) stars in Rise as Lou, a high school English teacher in a small town in rural Pennsylvania. He volunteers to take over the drama club, which he feels has been stuck in an unimaginative rut - an opinion that the current head of drama club, Tracey (played by Rosie Perez), doesn't appreciate. The two of them end up teaming up to try to breathe new life into the school's plays. The problem is that, as in most small American towns, football is king and drama is treated as the ugly stepchild and gets little funding. Lou immediately makes waves with the principal, parents, and school board by ditching the same old tired plays and choosing Spring Awakening, a show that deals with all kinds of taboo topics relevant to teens. He and Tracey struggle to recruit enough kids to play all the parts, even convincing the star quarterback, Robbie, to try out when Lou hears his incredible voice (slightly familiar, Glee fans?). The show chronicles both the play production as well as the challenges of the families of key students. Lou's own son, Gordy, is on a wild streak and seems to have a drinking problem. I always enjoy TV shows about high school - I was a total Gleek and absolutely loved Freaks & Geeks when I finally discovered it just last year - so I am enjoying Rise so far. It's mostly a straight-up drama, with scenes that include the kids practicing the play, and is as much about what happens outside of school as within those walls, touching on issues like sexual identity, gender identity, infidelity, divorce, single parents, teen drinking, and more. I've always liked Josh Radnor, and he does a great job portraying Lou's passion to make a difference. Rosie Perez is excellent as always, here in a multi-faceted role. The other actors playing parents, teachers, and kids are also very talented; it's a great ensemble cast. I'm interested to see where the show will go the rest of its first season. I've watched five episodes of the 10-episode first season so far (episode 8 airs tonight at 9 pm on NBC). I watch it On Demand, and you can also catch up on past episodes at the NBC website for free. You can also watch it on Amazon for $1.99 an episode or $16.99 for the first season. Ok. I'm hooked. I am going to find this and start watching! I think you'll enjoy it, Helen! I watched another episode today & it just keeps getting better.